Frederic Norton wrote in his 1700s era book Travels in Egypt and Nubia of four large pyramids at Giza. The only problem is that there are currently only three. It wouldn’t be impossible to cart off a pyramid, but it wouldn’t be easy either. Shouldn’t there be some evidence left? Some suggest Norton was talking about a pyramid further away from Giza, but his map has it very close. I haven’t found much on this “lost” ruin, other than at here. Yeah, I know, it’s a conspiracy site, but it has scans of some of the old maps. There is undoubtedly much to be found in Egypt, a civilization that lasted for 3000 years. The ancient world has yet to give up all of its mysteries. It may surprise us yet. 3000 Years: Will We Make It? The United States has been around for 236 years. We think that’s a long time. Rome endured over twice that. Ancient Egypt: Over 3000 years. Try to imagine that. They had periods of chaos longer than the U.S. has been a nation, and we think this recession is bad. The length of their existence is one reason they fascinate people to this day. How did they do it? That’s what draws people to study them. So do the temples and pyramids. Archaeologists have spent decades peeling back layers of the history beneath the sands. That many millenia of history piled over each other can make it difficult, but it’s amazing what we do know. They weren’t cavemen, but also not super-geniuses. Their math that built the pyramids was rather simple. Their astronomy was less advanced than the Mayans. Yet, in many ways, they were like us. We often think we are the only people to work, play, love and fight. People stuck in the modern world would surprised at how similar the peoples of the ancient world were. On the other hand, us moderns wouldn’t want to stranded in the ancient lands with their primitive medicine and short lives. It’s hard finding readable, yet scholarly, material on Egypt. Bookstores are full of strange, bizarre theories on ancient Egypt. Some just cannot believe the ancients could figure out how to move stones and stack them. Toddlers figure that out. A great place to start your learning would be Bob Brier’s engaging course, History of Ancient Egypt. If you have no interest in this ancient world, you will after listening to his informative and fun lectures. Then there is Barbara Mertz’s two part history Temples, Tombs, and Hieroglyphs and Red Land, Black Land: Daily Life in Ancient Egypt which have been the best intro to Egyptian history for decades. Both Brier and Mertz are Egyptologists. It’s fun to see where they agree and disagree (mainly the former). The books and course are good complements. Ironically, Brier supports the theory of women driving the leadership in Egypt more than Mertz does. Mertz overlooks Egyptian links in the bible, whereas Brier explores it. Brier is a mummy expert, and Mertz loves showing how human the ancients were. Both actually reference each other. Far more fascinating than fringe theorists. As exciting as a fictional world. Try something different. Try time travel into an ancient world. Read more here. Will the desert ever cease revealing the world of the ancients? Delve deeper into this ancient land with the audio class, Great Pharaohs of Ancient Egypt. Know the 7 wonders of the ancient world? Think UFOs built the pyramids? Are you worried about 2012? If you answered no, yes, yes, then you should ask for your money back from the schools you attended. Then read The Seven Wonders of the Ancient World, The Pyramids and Aztec and Maya and reclaim your education. Regardless of your beliefs, few would dispute that the Bible is one of the most important documents from antiquity. While the original autographs are lost, more copies of it exist than any other ancient writings. Some are also quite old. While not a history book per se, since its events are set in our past, the Bible does have many historical references. Understanding these passages may have been easy to the original audience, but not always for us. Granted, many people forget their elementary school comprehension skills and don’t consider: Who wrote this, when and where did they and to whom? The original context is necessary to understand what the authors meant then and what meaning it may hold for us, but I digress. Many have argued that this is a reference to the pyramids at Giza. A “pillar” at Giza (which may mean “border” or Giza being at the border or the Nile delta). But why? Why would God be involved in the building of this structure through a non-Hebrew people? Most people have dispensed with the idea that the Hebrews built the pyramids. The timeline and biblical references don’t fit. 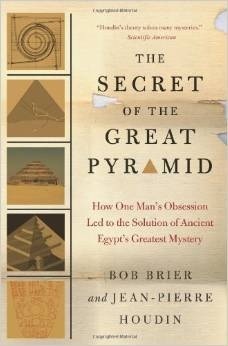 Others have created a variety of theories that interpret the pyramids and their internal and external structures as revealing biblical truths or signs of the creator. The problem is that they all seem forced and difficult to find. Though there is that verse. Is it a prophetic verse referring to the time Jesus spent in Egypt? The Bible is silent on his time there, but this would make more sense. Or is this one of those verses with more than one meaning? A fascinating reference. Perhaps someone will someday solve the mystery.